Perhaps a fair criticism, perhaps not. I will only point out that by using “old” instead of “superannuated” Moss would have made a much more compelling case for simplicity of style. Josephus, Condensed in Simple English! 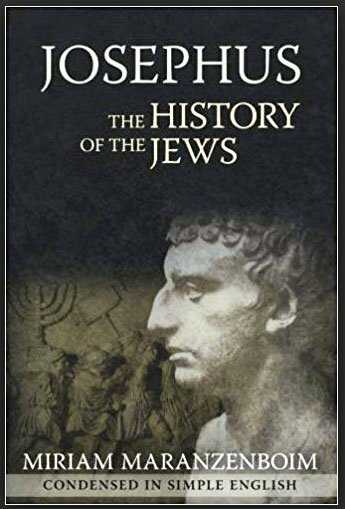 My first encounter with Flavius Josephus—the man whom famed Church historian, Eusebius, called the most famous Jew of his time— and Josephus’s epic work, Antiquities of the Jews, was as an undergraduate student browsing my university library. Twenty dusty (and, it seemed, deservedly, lonely) leather-bound volumes on a top-shelf row in a shadowy corner of the reference section, appearing to have never been touched. I desperately wanted to read the prodigious work from cover to cover, but I also hoped to finish school, find a job and someday start a family. Reading Josephus, back then, seemed incompatible with life. Widely credited with providing posterity with details of ancient life not found in any other record, the Antiquities have now been made more accessible than ever by my friend, Miriam Maranzenboim, whose book, Josephus, The History of the Jews is, as its cover claims, Condensed in Simple English. The first update of the Antiquities in nearly 300 years, it’s easy to read and understand and can also serve as a reference. Now I have undertaken the present work, as thinking it will appear to all the Greeks worthy of their study; for it will contain all our antiquities, and the constitution of our government, as interpreted out of the Hebrew Scriptures. Almost two millennia later, Maranzenboim’s condensation will appear more than worthy of study to modern readers who lack the time to plow through 20 volumes. Will the Nazi Eagle Rise Again? documents an alarming level of Church complicity in Israel’s enemies’ efforts to demonize and delegitimize the Jewish nation. “In 2004, America’s ambassador to the European Union, Rockwell Schnabel, warned the world that Antisemitism in Europe was reaching its 1930s level.” Since then, the phenomenon has only increased with rising and unprecedented support from Christian leaders and organizations. Chapter three refutes at length the persistent “apartheid slander” increasingly leveled against modern Israel. Chapter 4 notes the growing propensity for Israel’s critics to apply the even more fallacious and contemptible analogy likening Israel to Nazi Germany. In chapter five, Some Suggestions for “Turning it Around,” Dr. Friedman applies the preceding chapters to summarily dismiss the several slanders habitually leveled against Israel by her enemies and, now, the worldwide Church. The chapter calls upon the Church “to do some serious self-evaluation” and points to scripture, correctly interpreted, as a hopeful approach to stemming the rising tide of anti-Semitism. Four detailed appendices, elaborate end-notes, a glossary and bibliography follow. I found Will the Nazis Eagle Rise Again? What the Church Needs to Know about BDS and Other Forms of Antisemitism to be an important, informative, persuasive and well-written resource that successfully exposes as rebranded Antisemitism much of the Christian Church’s pro-Palestinian posturing. Dr. Friedman remains a gentleman throughout, consistently relying on logic and reason while avoiding an accusatory tone. At times his forbearance mildly disappointed me, especially in chapter two on the CATC conferences, by his apparent reluctance to identify by name some of the conference sponsors whom he quoted. What times these are when such outrageous questions clearly need to be asked! During this, the dawning Age of the Lie, it seems that reliable clues to the answers may only be found in insightful books like Dr. Friedman’s and the scriptures themselves, to which it often and accurately points. Dr. David Friedman is the former Academic Dean and Professor of Jewish Studies at King of Kings College in Jerusalem, Israel. Dr. Friedman lectures internationally on biblical topics as well as on the history of the modern State of Israel. A former member of the IDF, he also works actively at Jewish-Arab reconciliation as a speaker and mentor and is an advocate for a secure State of Israel. This review originally appeared in substantially the same form at kehilanews.com and is reproduced here with permission. What are they going to do to keep it? Book Cover, Catch the Jew, by Tuvia Tenenbom. There seems to be nothing Israelis dislike more than long waiting lines. Though this country has a robust universal healthcare system, my recent visit to a somewhat chaotic system pharmacy in Jerusalem perfectly demonstrates the phenomenon. At virtually any venue in Israel where lines are encouraged to form—checkout counters, post offices, city hall, the various governmental ministries—it seems like all attempts to proceed in an orderly fashion are vigorously opposed by the natives. After taking a ticket for service as I entered the pharmacy door, I experienced a classic example of the infamous Israeli distaste for decorum and found myself wondering, Why?